"For the best clean - Go green!" Vancouver Island's leading force in environmentally safe window cleaning and building maintenance services. Family owned and independently operated. WINDOW CLEANING, GUTTER CLEANING, MOSS REMOVAL, SIDING WASHING, PRESSURE WASHING, ﻿ROOF CLEANING﻿, GUTTER REPAIRS, AND MORE.. The Window Viper Glass and Gutter Cleaning Service is here to meet your needs. We guarantee you get the best cleaning service at your home or business for LESS. Window Viper provides you with a fast, eco friendly, professional window washing or gutter cleaning service, at a reasonable price. We care about your property and take great precaution as to not disturb your precious gardens and greenery. Plus, we only use the most gentle and eco friendly products on the market to ensure minimal impact on the environment. All work is guaranteed and customer service is top priority. You can rest assured that your windows and gutters will be cleaned using the safest and most eco friendly cleaning methods available. 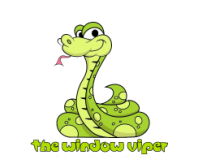 For examples of our green initiatives and safety standards please feel free to read the Window Viper blog by clicking here. Call for a free estimate today, and see why The Window Viper is quickly becoming the number one choice for Window Washing, Gutter Cleaning, Moss removal and so much more! For The Best CLEAN - "GO GREEN!" Serving Victoria, Duncan, Sidney, Salt spring Island, Ladysmith, Chemainus, Cobble Hill, MIll Bay, Cowichan Bay, the greater Cowichan area, and Nanaimo.